Today is Veterans Day, and this particular Veterans Day marks 100 years since the end of World War I. Over the last 3 years I have been fortunate to get to know many Veterans in our community through my board position with Crossroads Corral – a Central Florida based 501(c)(3) organization co-founded by my wife that promotes personal growth, hope and healing through the use of horses. Crossroads Corral’s leadership has a big heart for our Veterans and has collaborated with Mission Continues, Wounded Warrior Project, Camaraderie Foundation and other Veteran support organizations. 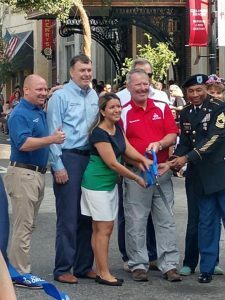 Priscila Kalagian & Mayor Dyer cutting the ribbon to start the Veterans Day Parade. As a community, we are thankful for the commitment that our Veterans have made to protect and serve our country. Many of the skills that Veterans have developed through their years of service translate very well into the business world. These include: hard work, commitment, determination, strategy, management, communication, resource allocation, the use of technology – the list goes on! With the help of my friend Priscila Kalagian, a Veteran and the Chairperson of the Orlando Mayor’s Veterans Advisory Council, we’ve organized a list of helpful resources for Central Florida Veteran entrepreneurs. The UCF Business Incubation Program recognizes veterans are equipped with a powerful set of skills including leadership, striving for excellence and completing the mission. Through the incubator’s Veterans Initiative, we help veterans realize and leverage those skills in an entrepreneurial setting. Whether you’re veteran looking to explore an idea for a potential business or need help scaling your existing company, Our Mission is to empower and support veteran entrepreneurs through business guidance, education and mentorship. Learn more about the veteran entrepreneurship programs offered by UCF. Boots to Business (B2B) is an entrepreneurial education and training program offered by the U.S. Small Business Administration (SBA) as part of the Department of Defense Transition Assistance Program (TAP). The course provides an overview of entrepreneurship and applicable business ownership fundamentals. Active Duty Service members (including National Guard and Reserve), Veterans of all eras, and spouses are eligible to participate. Learn more about the Boots to Business program. 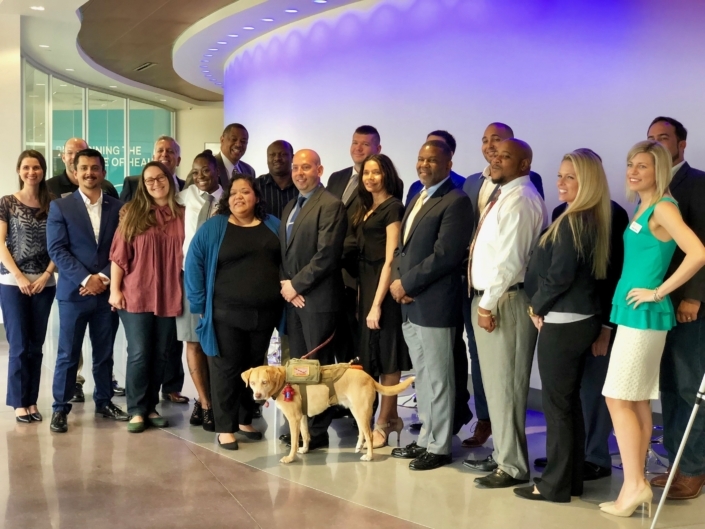 Each year, Camaraderie Foundations partners with local business members in the Orlando Area to provide a leadership program to assist transitioning service members prepare for a career in the local community. We provide this program free of charge to 15 highly qualified Veterans. Successful business leaders in Central Florida with prior Military service will serve as Mentors to selected Protégé Veterans at points of transition in their lives including: Veterans in college who will soon graduate, Veterans seeking new careers, and soon-to-be Veterans who will be transitioning soon. Learn more about the Camaraderie Foundation mentorship program. The purpose for the Florida Association of Veteran-Owned Businesses, Inc. (FAVOB) is to promote and unite the many established and start-up businesses that are owned by Veterans and Disabled Veterans throughout the State of Florida, and to increase awareness of the organization at the city, county, state and federal levels. Learn more about the Florida Association of Veteran-Owned Businesses. The Veterans Business Initiative is offered by a partnership through the Disability Chamber and CareerSource Central Florida. This comprehensive program will select approximately 100 highly qualified candidates who wish to develop and refine their business acumen. Participants will receive the tools, knowledge and personal contacts needed to further their mission of establishing a meaningful career while advancing their education, and developing their entrepreneurial skills. Learn more about the Veterans Business Initiative. The Veteran Entrepreneur Portal (VEP) is designed to save you time with direct access to the resources necessary to guide every step of entrepreneurship. VEP makes it easier for small businesses to access federal services, regardless of its source—and quickly connects Veteran entrepreneurs to relevant ‘best-practices’ and information. Learn more about the VA Entrepreneur Portal. In addition to the veteran specific resources, I would also encourage veterans to browse our Orlando Entrepreneurs resource center to take full advantage of many business and entrepreneurship resources that Orlando has to offer. On our resource center you can find organizations that assist with business advising, co-working space, funding, CEO roundtables, accelerators, incubators, and more. Learn more about Orlando Entrepreneurship Resources.